Cinque Terre: Our future homes! Italy has been filled with so many beautiful sights. We didn’t think it could get any better, but today definitely topped any beauty we have seen. This morning we took a 2 hour ride to Cinque Terre. When we first stopped we had a little free time. It had breathtaking views, and we learned it was a popular vacation spot for Italians to visit. We took many pictures here, and had some espresso to begin the day. Sarah also found her true love, an Italian boy named Miguel, which was all caught on film. Sadly for Sarah our boat tour was about to begin, so she continued to yell “I love you!” to Miguel, as we rode away while everyone stared on the boat. 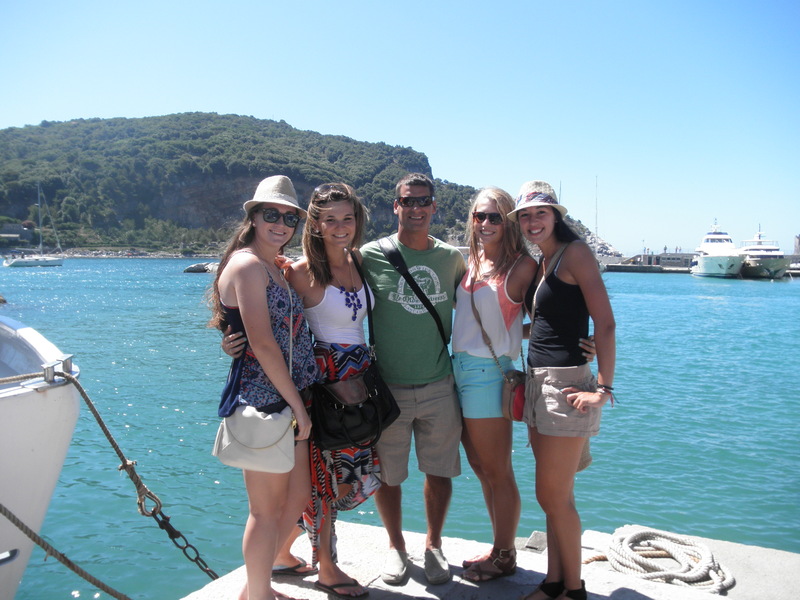 Ali, Haley, Coach, Katie, and I in Cinque Terre before the boat tour. We sat on the top towards the back on the boat and it was a bit more rocky than we thought. We all didn’t have seats so we had to hang on to something on the boat or else we probably would have flown in the water. Our tour was on the Mediterranean Sea, and while on the boat we saw the 5 villages of Cinque Terre. These villages were different than anything I’ve seen and it reminded me of something I would think to see in Greece. There were narrow, tall houses that were in the mountains and right on/next to the cliffs of the mountain. All were overlooking the Mediterranean Sea. We were supposed to stop in the first village, but since there was bad water conditions we could not stop. We stopped at the last village, Monterosso, and had free time to eat and shop. My group went to lunch first were we each split a pizza and trofi with someone else. Our tour guide told us Monterosso is known for trofi, which is pasta handrolled. To me it tasted doughy and different than spaghetti, but very good! After lunch we went shopping, where most of us bought pesto and the extra virgin olive oil. Monterosso is also known for their olive oil because they have the right conditions to grow the olive leaves. These villages also had beaches, which was mostly private for hotel guests to go on. The sand was soft black/gray and the water was such a clear blue, it was so pretty. Some of the girls decided to buy a swim suit and jump in the water, which they said was perfect temperature. After our free time we took a 5 minute train ride to Levanto where we met the shuttle bus, and then rode to the stadium for our game. Before we got ready, we went to a small restaurant right next to the stadium to have a pre-game dinner of penne pasta in red sauce, chicken with salad, and chocolate/cookie dessert pies. After dinner we were all set to play our first game, which didn’t start till 830! When we all saw the girls we would be playing, I’m pretty sure our jaws dropped. They seems really big and strong, and really good. Unfortunately they scored in the beginning of the game of a corner kick, but I think a lot was due to nerves. We began to play well as a team and quickly learned they were more aggressive than we thought. They also had a much different style of play where they would use their body in ways we are not used to in order to shield the ball. This made it somewhat difficult to get adjusted to but we still held good competition. Towards the end of the game they scored again to end the game 0-2 loss for us. Although we lost, we all enjoyed playing and could’ve continued to play more. I think if we played them again we would definitely be a competitive match! After the game we had an hour bus ride back to the hotel, so we are all showering and going to bed now. Tomorrow will mostly be a travel day for us. When we wake up were are going to have a 4 hour ride to Como. Lake Como supposedly has views unlike anything we have seen before, so we are all excited besides the long traveling part. It’s crazy how beautiful Italy is, it seems to be never ending!